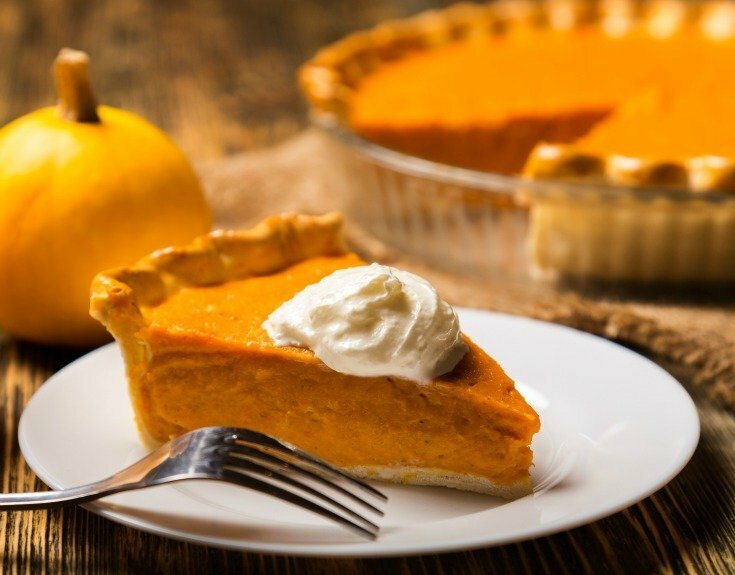 Bringing a pumpkin pie to a get together is a sure way to be remembered. The spices in the pie bring feelings of warmth, comfort, and nostalgia. TFL’s pumpkin pie recipe is a favorite with family and friends. Our tips for preserving pumpkin will help you keep the aroma flowing from your kitchen year round. To me, pumpkins are a delightful squash to grow because of their low maintenance. After planting seeds or transplanting seedlings, you water, mulch to keep down weeds and hold in moisture, then let them be. They lie in the field until the vines are dried up and you harvest. The pumpkin has a long growing season, 90-120 days depending on the variety you plant. You’ll find all the planting and care instructions you need in our earlier post on The Great Pumpkin. After waiting all those long days for the pumpkin to be ready for harvest, the day has arrived and you have a lot of these sensational squash. Now what? 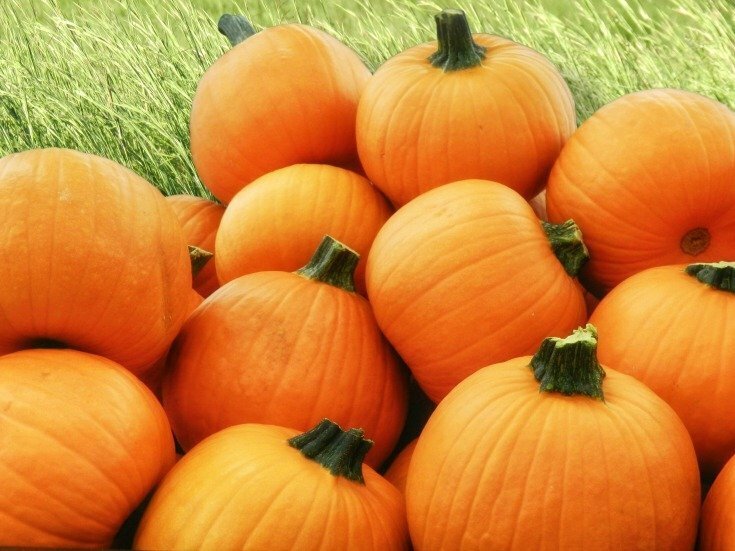 Stored pumpkins, like other large squash, should never freeze. They are immediately mushy and ruined. 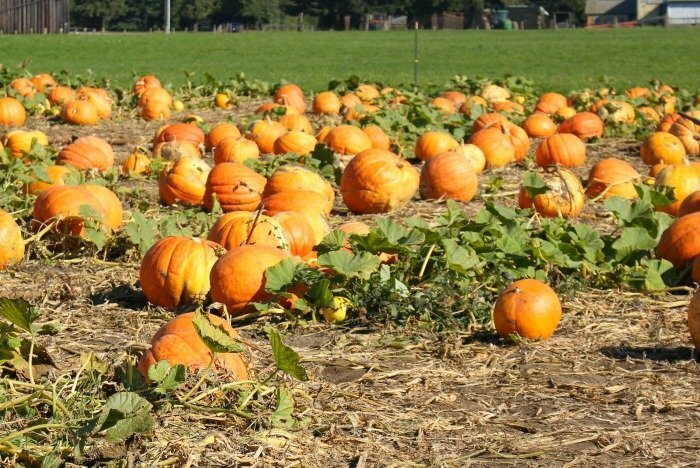 It’s best to store your pumpkins so they won’t touch one another since the places they touch will be the first to rot. Most of us don’t have the space to do this with all the pumpkins. We solve this dilemma by stacking the ones we plan to use for livestock and separating the ones we intend to eat ourselves. Regular checking ensures the bad ones get fed to the stock first. They don’t seem to mind bad spots! If a pumpkin we plan to eat develops a bad spot, I cut it out and preserve or use the pumpkin right away. The best temperature for long-term storage of pumpkins is 50 to 60°, but as with everything else, we do the best we can and keep a regular check on them. If you’re blessed with a root cellar, you have the ideal storage place for them. The pumpkins we set aside for us to eat are kept in an unheated room in the house. We check them regularly and have had pumpkins harvested in October still good in early March. Freezing – Cut open the pumpkin and remove the seeds. Place slices or pieces of your desired size in a large pot and add just enough water to cover the bottom of the pot, 1/2″ or so. Boil until the pumpkin begins to soften. I have steamed and baked the pumpkin for this same purpose. As soon as the pumpkin starts to soften, the rind is easily removed. Remove from heat, remove the rind and mash the meat slightly. The pumpkin doesn’t need to be pureed, but you can if you want. Put as much as you would like in your freezer bag and place it in the freezer. As soon as the pumpkin starts to soften, the rind is easily removed. Remove from heat and let it cool to touch. Now, remove the rind and mash the meat slightly. The pumpkin doesn’t need to be pureed, but you can if you want. Place the amount you want into your freezer container, bag or bowl, and place it in the freezer. Be sure to label with the date and the contents so it doesn’t get lost in there. Drying – The old-timer’s preferred method of pumpkin preserving was drying. They used the sun and circulating air to dry theirs, where I use a dehydrator. Uniform slices make for successful dehydrating. Slice the pumpkin into round slices, 1/4″ thick. Next, remove the seeds, fibers, and rinds. I’ve tried peeling the pumpkin then cutting into slices, but it seemed harder to me than peeling it after I sliced it. Now, cut the round slices into pieces no larger than 1″ and place them on trays in the dehydrator. Dry on 120° for 18 to 24 hours. They will have a leathery texture. To rehydrate: (1)cover the desired amount of pumpkin with water so there is 1″ of water over the top and boil until it’s rehydrated (quickest way). It will look like just cup pumpkin and become soft. (2) boil water to allow a 1″ covering of the pumpkin and soak 4-8 hours or (3) steam the pumpkin. I find steaming to take 8-12 hours to rehydrate. 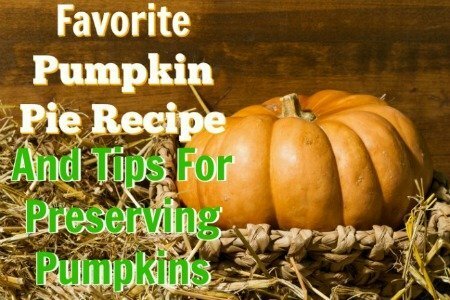 I’m often asked if dehydrated pumpkin can be used in a pumpkin pie recipe, the answer is yes! Just rehydrate, cook down and puree. No worries, I tell you below how to cook pumpkin down. It’ll be ready for any recipe. If you’re making pumpkin soup or adding the pumpkin to soup, you don’t have to rehydrate first. Just add a little extra water to the broth base to allow for rehydration. Remember dehydrated foods shrink tremendously so a little goes a long way. It will take some practice using dehydrated pumpkin to know the equivalent of dried to rehydrated. Don’t worry if you rehydrate too much, it will keep for at least a week if kept cool. Canning – Slice the pumpkin and remove seeds. You can peel the slices now or boil them until they begin to soften and then remove the rind. For canning pumpkin, I peel them after I slice them. This seems to save time. Cut the slices into 1″ cubes, cover with water and boil. Continue to boil them for 2 minutes. Hot pack the pumpkin into sterilized jars. Pour the hot liquid over the chunks in the jars being sure to leave a 1″ head space. Try not to mash the pumpkin chunks while putting them into the jars. Use the pressure canner of your choice to process your pumpkin. I always check the guidelines in case something has changed. My pumpkin pie recipe is a favorite of my husband, J. Most people think of it as a holiday dessert, but he often requests it throughout the year. For us, it’s a comfort food, especially with whipped cream on top! You can use pumpkin preserved in any of the ways we’ve shared, store bought canned pumpkin or fresh pumpkin. He prefers the fresh pumpkin approach. I begin by cutting the pumpkin in half and removing all the seeds. Then I place it upside down in a shallow baking pan. You want to add enough water to just reach the rim of the pumpkin rind. Next, bake the pumpkin on 400 for about an hour, depending on your altitude. You want the pumpkin to be soft. Remove the pumpkin from the oven and let it cool. When it’s cool enough to handle, scrape the pumpkin flesh from the rind and puree in a blender or mixer. If you don’t like this way, you can cut the pumpkin into slices, peel and cube those slices. Cover the bottom of a large pot with water and add your chunks. Bring them to a boil and cook down. The process of “cooking down” is to remove all the liquid from the pumpkin. The pumpkin will begin to thicken as the water leaves it. You’ll know it’s ready when you don’t see liquid during stirring, and the pumpkin is dark orange and thick like canned pumpkin. Be sure you keep a constant eye on it and keep it stirred. It will burn quickly once it thickens. Watch out for the bubbling air pockets, they will pop and burn you. This is why I prefer the oven. I forget things on the stove sometimes, I just do. Preheat oven to 425 degrees F and prepare your crust. Place the prepared crust in your 9″ deep dish pie plate. In a medium bowl, beat eggs with wire whisk or electric mixer. Add the other ingredients in order mixing well after each addition. To keep from spilling the pie filling, place the pastry lined pie plate on the middle rack of your oven. Pour the filling into the pie plate. Bake for 15 minutes on 425 degrees then decrease the baking temperature to 350 degrees F. Continue baking 45 minutes or until a knife, inserted into the middle of the pie, comes out clean. Cool the pie on the counter or in the refrigerator for 4 hours before serving. This allows the pie to set. Depending on your altitude and temperature, it may not take this long. I usually make my pies the day before or early in the morning. We like to top ours with whipped cream, but it isn’t necessary. For more perfectly pleasing pumpkin recipes check out Yummy Pumpkin Recipes board on Pinterest. 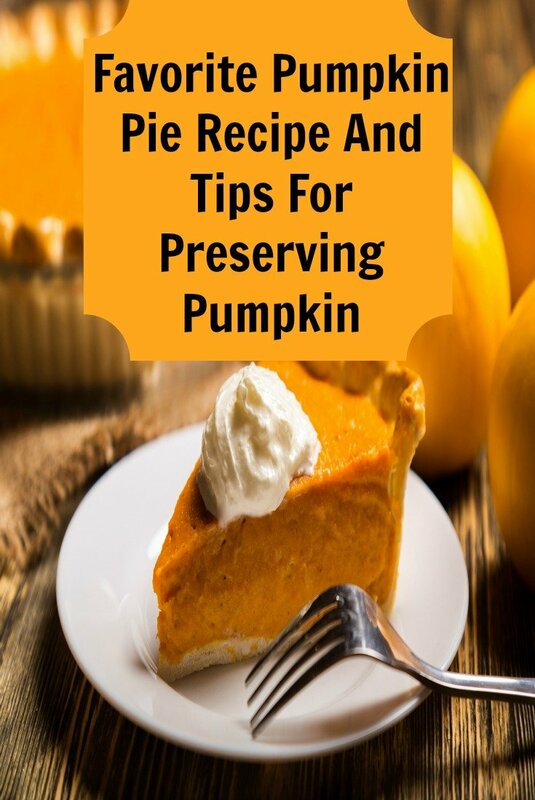 Have a tip for preserving pumpkins?